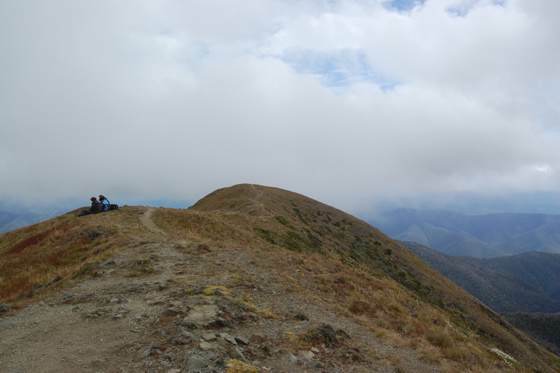 Mounts Feathertop and Bogong, located in the Alpine National Park provide some excellent walking. I’ve climbed both several times before, but wanted to try a couple of different ascent routes, both of which are lesser used because a 4WD is pretty much required to reach the starting points. The approach to Feathertop along the Razorback from Mt Hotham is a deservedly popular approach. This walk also follows the Razorback, but from the north and is a much lesser used route due to the difficulties in accessing the start. The walk itself is quite attractive, beginning with good views from the launching point which is just above the tree line. The path then drops back into the trees and a saddle before beginning a steep ascent that soon reaches the tree line again and then follows the spine of the Razorback south to the summit. Except for a small section just after the start, the path was reasonably clear for the whole length. 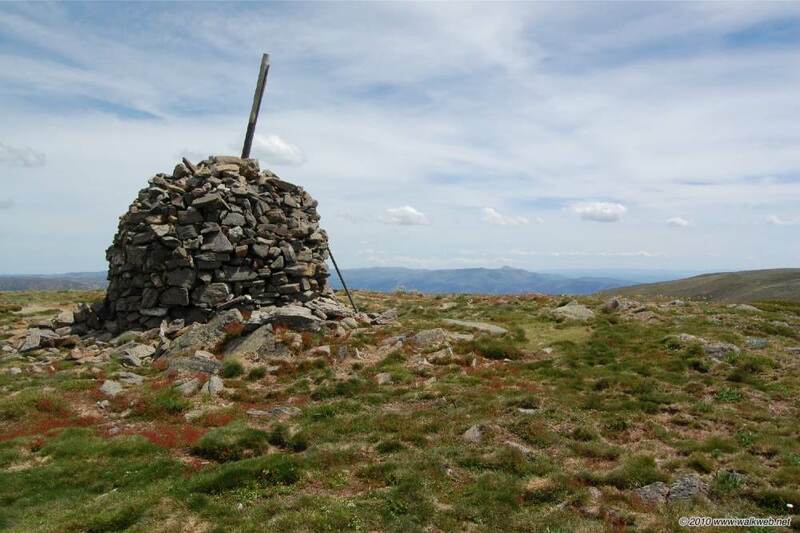 Once you are out on the ridge navigation is very simple in good weather – the only way is up. I descended via the Bungalow spur as I had arranged a car shuffle. Total time for me was around four and a quarter hours including breaks (about two hours ascent to the summit), which makes this easily the quickest way up Feathertop and certainly provided a welcome change to the usual routes. Access: Easiest access is via the Snowy Creek road which leaves the Great Alpine Road not far out of Bright. This gravel track leads to an intersection with Dungey Track which is followed until it eventually reaches an intersection with Stony Top Track. From this point Stony Top Track is followed and a 4WD is the best choice, the track gets particularly rough after the seasonal road closure gate at the boundary of the national park, some 2km prior to the end of the road. Note that there is not a lot of room to park or turn around at the end of the track. Originally I planned to walk from the end of the 4WD track on Granite Flat Spur, however we ended up turning back about a third of the way along this track after reaching a particularly difficult section where a large part of the right hand side of the track had been washed away. We decided that it would be best not to risk negotiating this section and returned to the junction with The Hollow Way where there is room to park, and from which point I commenced the walk. 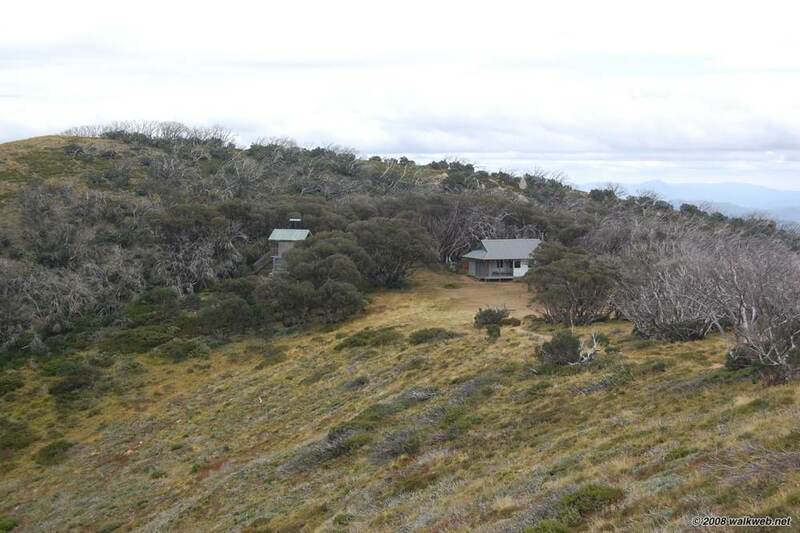 I initially walked back up the Granite Flat Spur jeep track, providing an enjoyable 2km or so ramble through attractive bushland before the track ends in a small clearing which provides room to park and turn around and would make a pleasant camping spot. From the parking area there were good views of the walk ahead and a clearly marked walking path quickly began a fairly steep ascent of Granite Flat Spur. After a kilometre or so there is a sign-posted side path to Michell Hut on the Eskdale Spur and not too much farther on the walking track joins the Eskdale Spur walking track and breaks through the tree line. This point which provides magnificent views into the Kiewa Valley, across to the Staircase Spur, and up to Mt Bogong, is a nice place for a quick rest before the final ascent up the Eskdale Spur. This final section is fairly steep, but once the main ridge line is reached, it’s an easy stroll up to the rounded summit of Mt Bogong. I had again arranged a car shuffle and so descended the Staircase Spur, which as previously, seemed to go on forever. Total time for me was around 5.5 hours including breaks, with the ascent time being about 3 hours. Access: We approached from the Mountain Creek camping area, following the Mountain Creek 4WD track that proceeds east from the camping area, passes the bottom of the Staircase Spur and then climbs to Camp Creek Gap at the base of the Eskdale Spur, before descending very steeply and then ascending steeply along The Hollow Way to a clearing and the junction with the Granite Flat Spur jeep track. 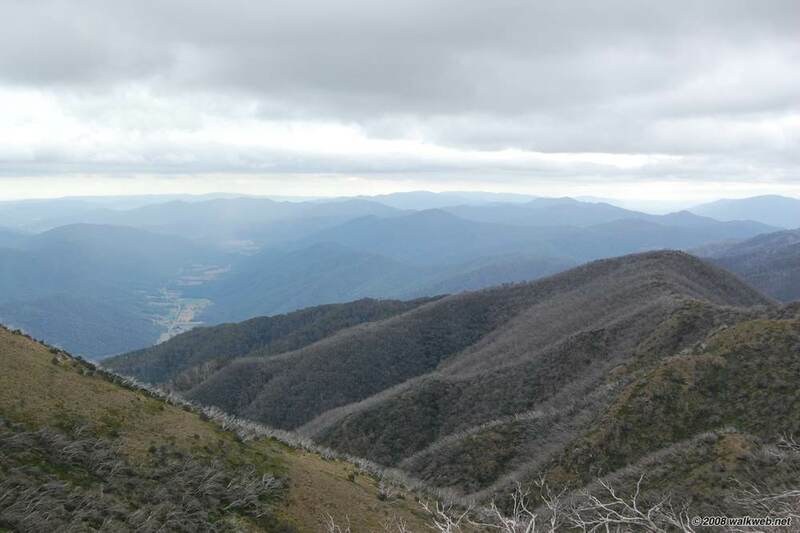 This was my “20th anniversary” walk up Mt Feathertop, and I ascended by the popular Bungalow Spur route. A nice day, so there was quite a bit of traffic. A prior post with a map and link to Parks Victoria track notes can be found here.